We start the Arnos Grove section of the Piccadilly Line from Maidstone Road, N11, where trains emerges from the very long tunnel section that begins near Hammersmith. Although we are within a stone’s throw of Arnos Grove station, in terms of location, we are still technically within Bounds Green. The boundary with Arnos Grove station is by the viaduct over the Bounds Green Brook. The Maidstone Terrace tunnel portals are difficult to photograph due to the latticed wire roofing and high concrete sides meant to stop people peering over the sides or throwing stuff on the tracks. 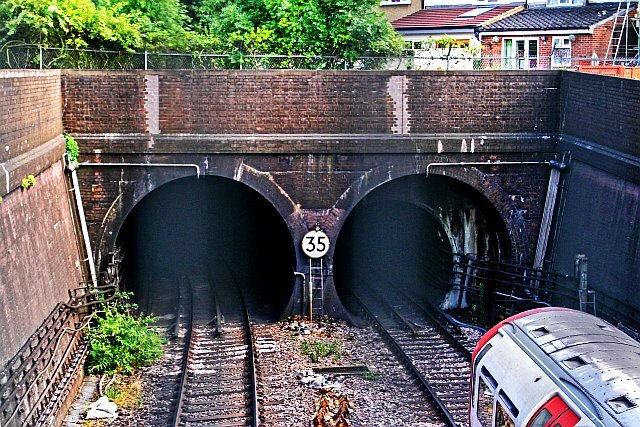 The tunnel portals by Maidstone Terrace, Bounds Green. 31 July 2017. 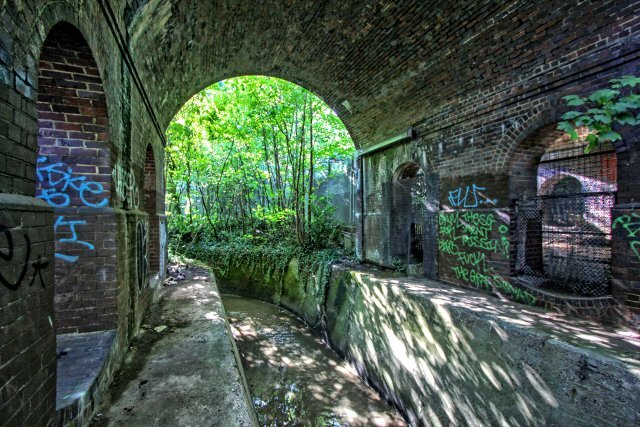 As soon as the line emerges from the Bounds Green tunnels they cross a pair of viaducts and a 175ft long steel over bridge. The first viaduct is a short one and the second longer. This is the valley of the Bounds Green Brook, a tributary off Pymmes Brook. The A406 North Circular Road runs alongside the brook and under the Piccadilly’s over bridge. Immediately beyond is Arnos south viaduct. I dont know how many arches it has, but one of these crosses the Bounds Green Brook as shown below. The section of viaduct over the Bounds Green Brook. 31 July 2017. Its a quite short distance from the Bounds Green Brook to the stabling sidings at Arnos Grove. Arnos Grove stabling sidings, overlooked by Swinson and Jackson houses. 13th August 2017. The sidings are on the west side of the railway, and these merge with the main tracks in the station throat. The station platforms themselves are in a cutting to maintain the route through this quite hilly part of North London. Even at Arnos Grove the line still has a climb of over two hundred feet from the tunnels to Cockfosters, that’s a continuous gradient averaging 1 in 60. 73 tube stock by the Arnos Grove sidings. The viaduct ends by the rear of the train. 31 July 2017. From the tunnels to Arnos Grove several gradient posts can be seen on the west side of the tracks. These are better observed from westbound trains (eg those heading towards Bounds Green.) This is one of two Arnos Grove mysteries I find puzzling. At least four gradient posts exist in this very short section between the tunnels and the station. There’s another on Arnos Park viaduct. Yet there are absolutely no gradient posts from Arnos Park to Cockfosters! The stabling sidings are in daily use and adjacent Ash House is the staff facilities and train management depot. Its interesting that a subsidiary depot was built here, after the arguments postulated in the 1930s that a depot built here was not going to be of much use. 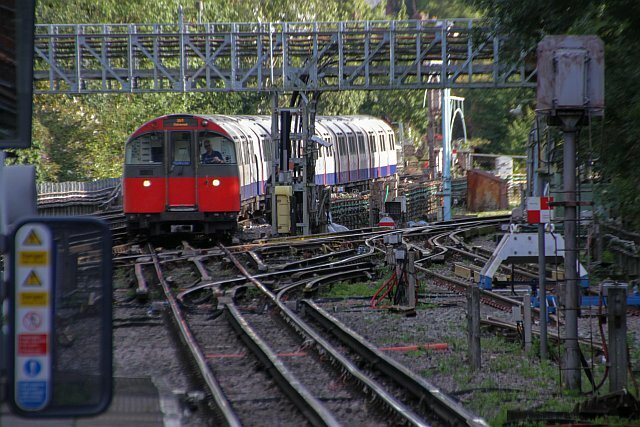 To recap from an earlier post, that is why the Piccadilly Line was extended on to Southgate and Cockfosters in order to provide proper depot facilities with entry points at both ends. LU 73 tube stock departs Arnos Grove for Heathrow T4 & 1,2,3. August 23rd 2017. Another mystery that intrigues me is the station’s sidings have a pair of loading gauges for both tube and main line stock. Why? Mainline stock can’t even use the Piccadilly Line! Tube train loading gauge fine, but a main line one too? Between the loading gauges and the station stands Ash House. This is the management and staff facility centre, linked to the main station via a series of covered footways. The facilities enable staff to have rest breaks, sign on duty etc. Ash House also manages the stabling sidings plus train cleaning. PJ4/600. Signal with two roles. Semi auto or draw up. The eastbound home signals at Arnos Grove are different and special colours denote their extra roles. These are PJ3/500and PJ4/600 which act either as normal semi automatic signals, or as draw up signals. If the route ahead is absolutely clear these will operate normally. If there is a potential route conflict out of the station towards Southgate, these signals become draw up signals. Trains approaching the station from Central London must then slow down to almost a stop, before the signal will clear and permit a route into the station platforms. PJ320 is similar and protects the westbound exit from the station. Arnos Grove was originally countryside as the above tweet demonstrates. Only just in the countryside in fact. The at the time houses ended at Bounds Green. There was an invite for people to suggest names for the new station – everyone was happy with the first one shown on the hoarding! Early drawings from 1926 in advance of the final plans show Arnos Grove having goods facilities. 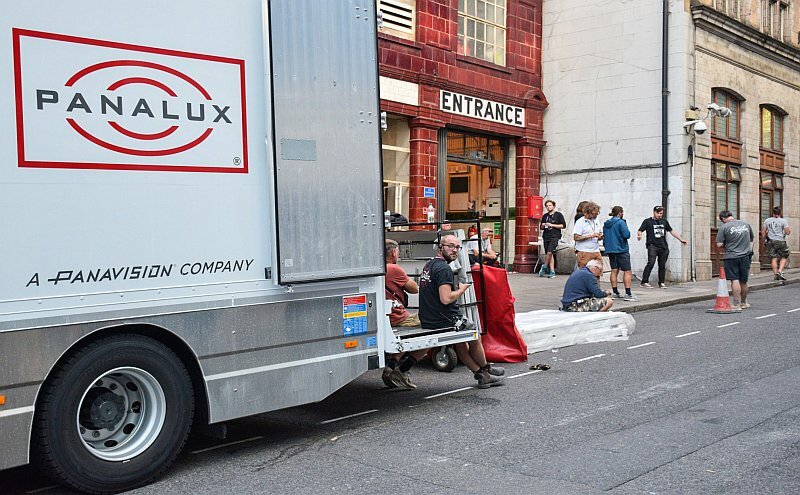 Even at this time freight was still seen as a possible source of traffic on the tube. In the 1900s the Piccadilly Line apparently had a direct lift connection to the GNR’s milk sheds at Finsbury Park! Instances such as these show the tube’s builders had more than just passengers in mind. In fact freight on the tube system has a much stranger history than is realised. Below: Shot of the station on 15th September 1932, four days before public services began. 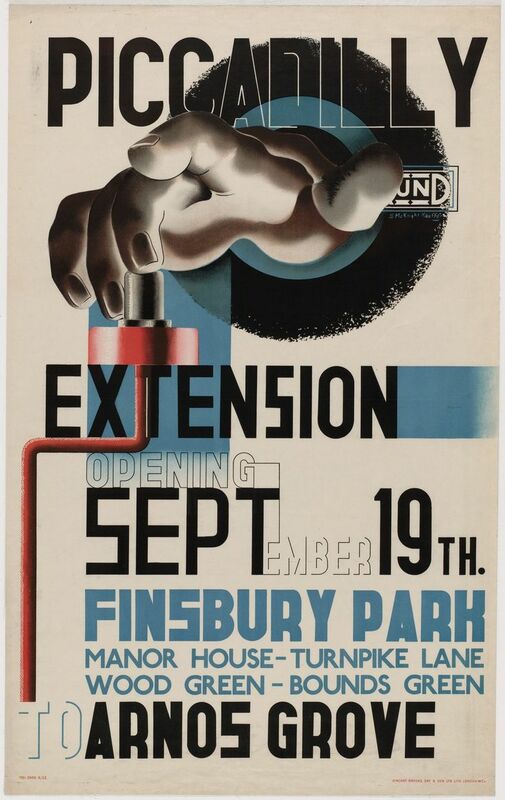 Below: Poster advertising the new service from Finsbury Park to Arnos Grove. 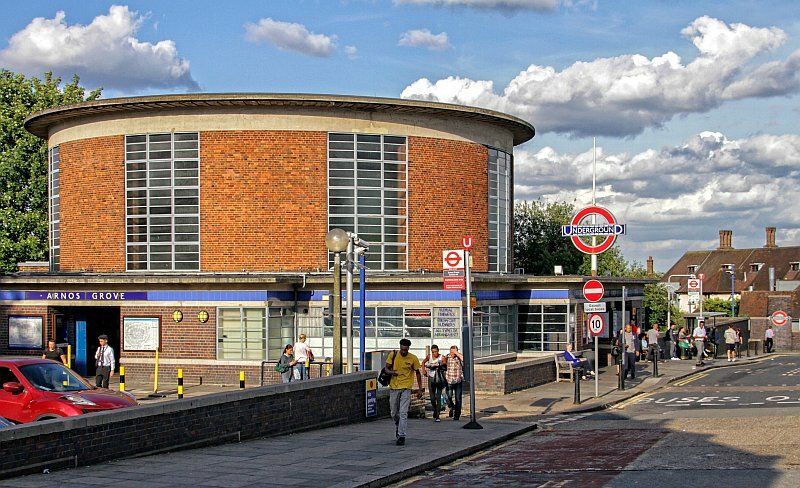 Arnos Grove station was designed by two of London Transport’s top architects. Holden drew up the surface building design, however the platforms were designed by Stanley Heaps, who may have also done those at Oakwood. General view of Arnos Grove station. 31 July 2017. Shape of Arnos Grove station from above. The ticket hall with its huge pillar. 20th July 2017. The newer part of the station with LTPB seating and a gradient post visible on the far wall . This unusual style of seating is also found at other locations such as High Street Kensington and Hammersmith stations. Arnos Grove’s platforms are quite unusual that they employ both concrete and steel columns to support the canopies. Those with steel support were built later to give additional all weather protection. Disused indicator at Arnos Grove which once denoted trains for Southgate, Oakwood & Cockfosters. The other indicators at Arnos Grove have been blacked out. It is evident this was similarly treated too. The piece of black paper in the upper left corner is evidence the covering was torn away leaving the old destinations on show. One of the many panels on the footbridge depicting the station’s history. Arnos Grove platforms on 13th August 2017. A similar view to that taken in 1932. For the second time we have reference to the Piccadilly offering a two and half minute service – and this was in 1932! As I have said before, we think the Victoria Line’s getting up to scratch with its current 36tph but that’s somewhat laudable when some of the older tube lines were doing nearly as good with conventional signalling! Report 18 Sept 1932 highlighting the rural nature of the Piccadilly line. Upon leaving Arnos Grove station trains immediately begin their journey across Arnos Park by way of the very long viaduct. 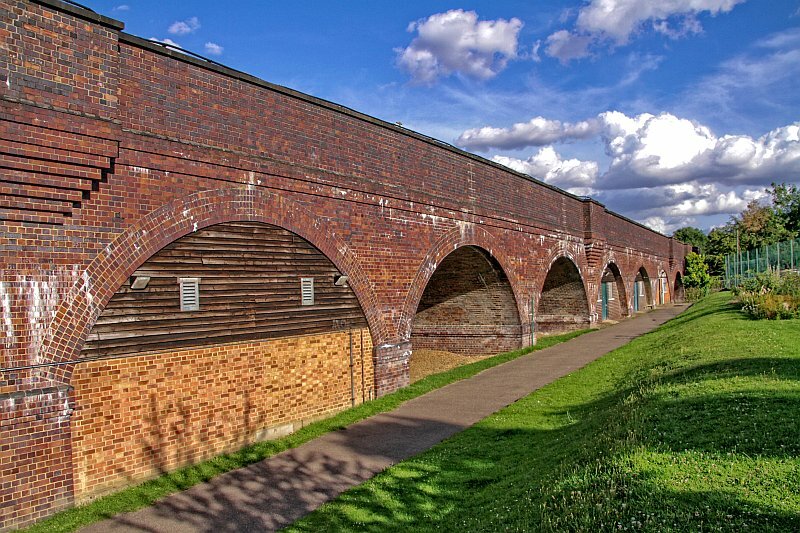 It crosses the Pymmes Brook , three local roads, and was one of the more expensive structures on the new extension. Three million bricks were used in its construction. Arnos Park viaduct 31 July 2017. Arches 1 to 7. Some are used as toilet or changing facilities for the tennis ground. Despite the great interest caused by its construction, the impressive nature of the viaduct did not really come into its own until services were extended north to Enfield West on 13th March 1933. Thats it for now. This feature was published on the anniversary day itself, 19th September. Posts will continue in a couple of weeks time, unrelated to the anniversary, with coverage of Southgate, Oakwood and Cockfosters stations, plus other features on the Piccadilly Line en route. TfL messes up its disability access advice!